I love a bargain and this week a found a real cracker: a 'White Stuff' skirt for just £3.99. My workwear wardrobe has really suffered since I started working from home and I tend only to dress up when I have client meetings. However, this weekend I am off to a conference with my biggest client, so I was looking for something smart yet comfortable. 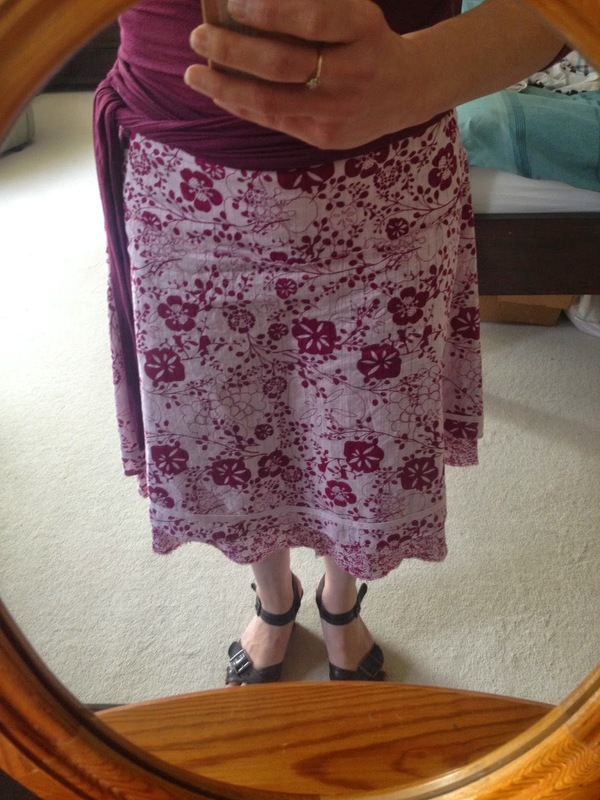 The 'White Stuff' skirt, which I found in the YMCA charity shop in Teignmouth, ticked both boxes. 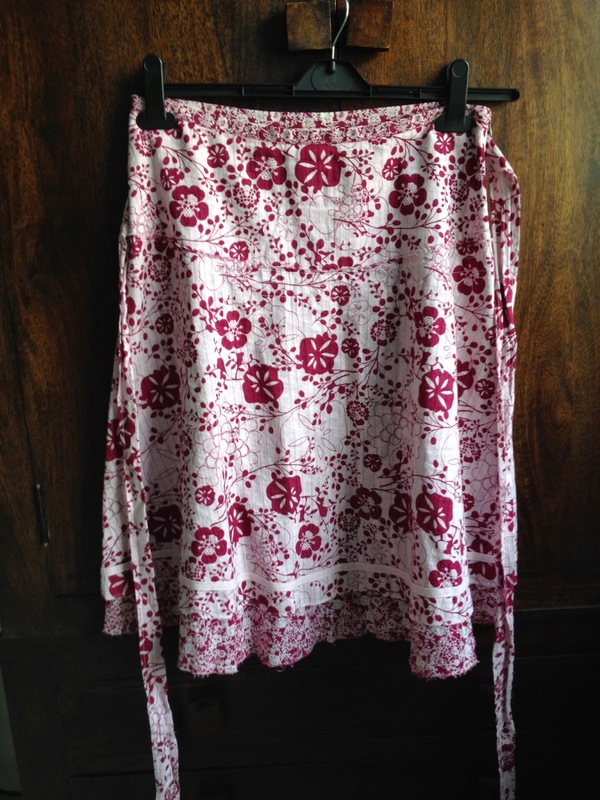 The skirt has an underlayer of smaller burgundy flowers on a pale pink background. Larger flowers adorn the over skirt, which is slightly shorter with a split up the back to reveal the underskirt. The garment is finished with an integrated tie-belt, which is long enough for you to choose whether to tie it at the front, side or back. 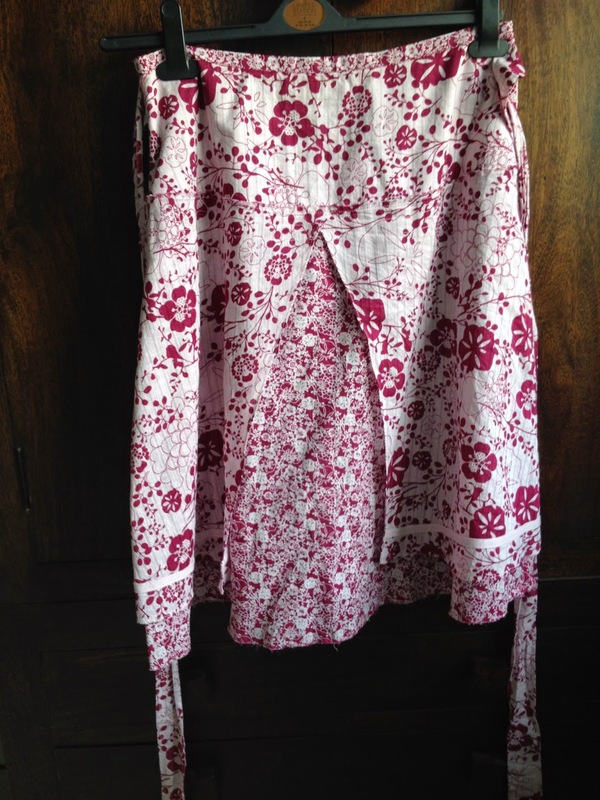 It's perfect for spring, summer or autumn and versatile enough to be worn to client meetings or for the school run. Plus, it goes perfectly with a lovely burgundy 3/4 sleeve wrap top I had picked up last year in the British Heart Foundation shop for just a few pounds and some brown strappy wedge sandals. What charity shop bargains have you found recently? 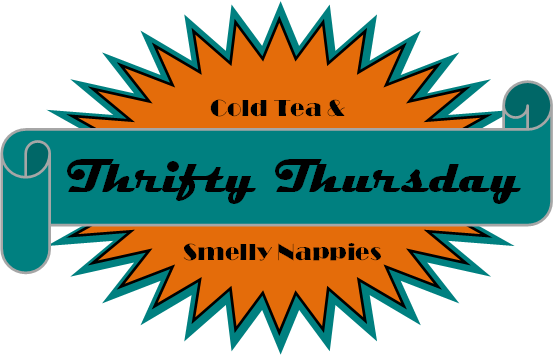 Thrifty Thursday is a linky established by Cold Tea and Smelly Nappies as a place to share posts about anything to do with saving money and being thrifty. Thanks - I'm trying to blog a bit more frequently and I love your linky. The charity shops in Teignmouth are great. I usually manage to find something lovely. And the staff are always friendly too. Charity shops is one of the few things I miss about not living in the UK. They almost don't have them here in France so I have to get my fix when I do a trip to the UK. I will be on the Devon/Somerset border when I next come over ...maybe I should make a trip to Teignmouth! Ooh yes, definitely do pay Teignmouth a visit. It is a brilliant little town. As well as the charity shops there are plenty of independent shops selling all sorts, especially some amazing products by local artists and craftsmen. There is always something going on with lots of festivals virtually every weekend through the summer. And then there's the beach and river and an amazing playpark for the children on the seafront. I absolutely love living here.